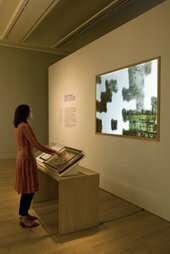 This room features a display including Constable’s studio materials, as well as interactive screens that explore how Constable worked. Conservation techniques and analysis can reveal surprising aspects of an artist’s working methods. Such examination suggests that Constable’s approach was both systematic and spontaneous. Although the landscapes he made outdoors are generally quite accurate records of a given scene, those he made in the studio are artfully composed, with plenty of room for imaginative reworking. One activity in this room focuses on a recent x-ray examination; the other reveals Constable’s process of ‘squaring-up’. See Constable’s techniques to explore how conservation techniques and analysis revealed Constable’s working methods.